EPR’s 2018 online campaign on employment and disability has come to an end. Employment is one of EPR’s key areas of work with our members. 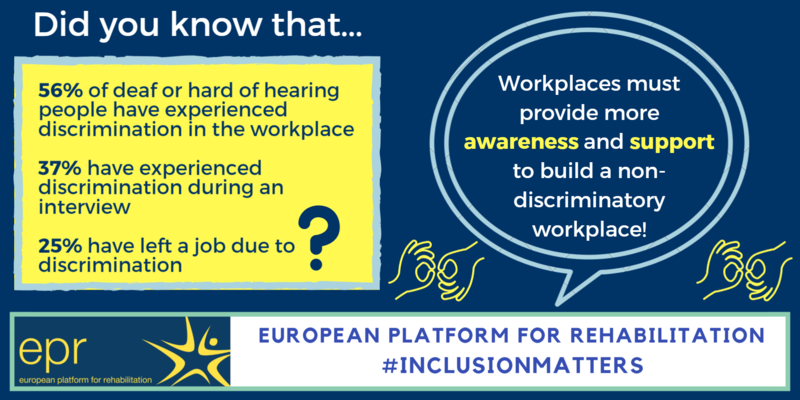 As such, we created various infographics for Twitter on the subject, using the hashtags #EmploymentForAll and #InclusionMatters. The campaign highlighted many themes central to employment of people with disabilities, including: workforce barriers, neurodiversity as a competative advantage, workplace accommodation, discrimination in the interview process and the workplace, the importance of education and continuous training, and much more. The 2018 employment and disability campaign was EPR’s first online campaign. Our 2019 online campaign will be on gender and disability. To stay updated or to follow the campaign, follow us on Twitter at @EPR_Network.